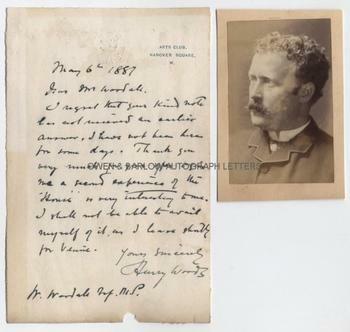 HENRY WOODS autograph letter Signed. ALS. 1p. Arts Club, Hanover Square, W. May 6th 1887. To [William] Woodall. Together with a contemporary portrait photograph. "I regret that your kind note has not received an earlier answer. I have not been here for some days. Thank you very much for your offer to give me a second experience of the "House" is [sic] very interesting to me. I shall not be able to avail myself of it, as I leave shortly for Venice." 8vo. Approx 7 x 4.5 inches. Lacking integral blank leaf, mounting residue to blank vers and small chip at foot (not touching text). VG. 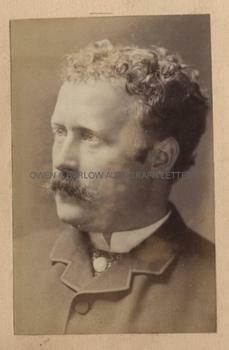 The portrait of Henry Woods is an albumen photograph of carte de visite size, approx 3.75 x 2.5 (excluding mount), mounted on card from album leaf. He is shown head and shoulders in half profile. The photograph is in fine condition. Henry Woods with Luke Fildes was the leader of the group of painters known as the "Neo-Venetian" school and in 1874 Henry Woods married Luke Fildes' sister, Fanny. In 1876 Henry Woods settled in Venice, where he spent much of the remainder of his life. He there fell in with a cosmopolitan artistic community, which included the American artists Whistler and John Singer Sargent who became his close friends. 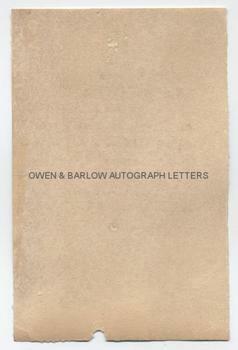 Both the letter and the photograph are from a 19th century collection made by the radical Liberal M.P. and trustee of the Wedgewood Institute, William Woodall.